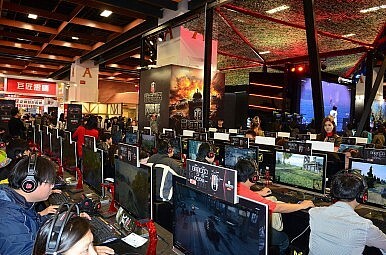 It may have been his first time in Taiwan, but the American online gamer – username “Angrypug” – was greeted as a local hero as he arrived at this year’s Taipei Game Show. Young Taiwanese gamers flocked to the stand of online streaming brand Twitch, where the bearded pug lover obligingly posed for selfies. Angrypug has risen to fame by playing the post-apocalyptic zombie game H1Z1 – and discovering that tapping into the feud between China and Taiwan over Taiwan’s identity and status can be lucrative business. The videos have become a sensation in the online gaming world, both in the United States as well as in Asia. A single video of Angrypug’s “Taiwan #1” has around two million hits on YouTube, but this does not include the great number of people who watch his live streaming. They first appeared last summer, and became the most popular discussion thread on U.S. online forum Reddit at the end of November. But they’ve become even more popular in Taiwan, for the obvious reason that his declaration of superiority of Taiwan over China is playing into a younger game-playing generation who grew up feeling distinctly Taiwanese and are proud of their identity. One Taiwanese DJ has even mixed soundbites of Angrypug shouting “Taiwan #1” into a techno song. Angrypug’s “Taiwan #1” trademark is good business for him. He has over 60,000 followers, and subscribers to his channel pay $4,99 a month – for which you get a “Taiwan #1” badge and emoticons. His “Taiwan #1” YouTube videos have between several hundred thousand and two million views, a perk that would allow him to share in revenue from advertisements. Whilst Angrypug makes a buck out of Taiwan national symbolism and pride, similar sentiments got a Taiwanese pop star into an unfortunate predicament a few weeks ago. The day before Taiwan’s landmark elections, Chou Tzu-yu, member of a Korean pop band, was forced to read out a scripted apology after waving a Taiwanese flag, which had angered Chinese netizens. “There is only one China. The two shores are one. I feel proud being a Chinese,” Chou says in the video. Angrypug, perhaps rather wisely, steered clear of political questions during his visit in Taiwan, instead only talking about trivialities such as Taiwan beer and the local delicacy “stinky tofu” (Angrypug was not available for comment for this article).